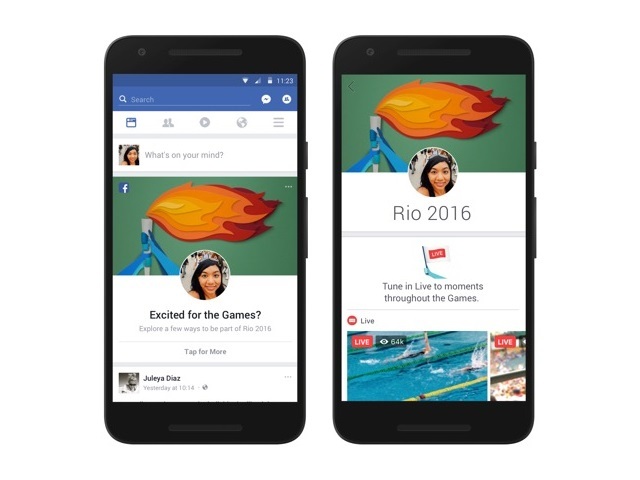 Facebook introduced a host of features in advance of Friday’s Opening Ceremony for the 2016 Summer Olympic Games in Rio de Janeiro. Users can add temporary profile picture frames to their profiles to support their countries. Starting Wednesday, country flag masks can be added to photos and videos, including Facebook Live videos, via the MSQRD application, which is available for iOS and Android. Finally, Facebook users will see a special greeting atop their News Feeds (pictured above), leading them to a page with Olympic content including search results, conversations, events and Facebook Live videos. The social network will do the same prior to the Aug. 21 Closing Ceremony. Facebook users: Are you ready for Rio 2016?